Over the years and with a lot of wear and tear, Bathtubs can develop many problems. Sometimes rust will begin to show around the drain or around the overflow plate. This can appear very unsightly and embarrassing to the host who has guests or other family members using the Bathtub. Chips and scratches often appear after many years of use. 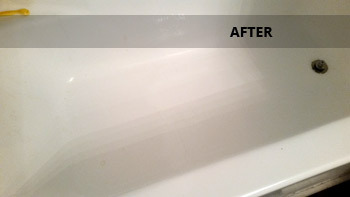 Caulking around the tub becomes black and moldy looking. Sometimes the caulking disintegrates over the years. With fiberglass or acrylic Bathtubs sometimes cracks appear on the bottom and water will leak out onto the Bathroom floor or behind the wall. This will cost the homeowner a lot of money in repairs. Frank's All Surface Refinishing can make all of these types of repairs. We chip away at the rust and apply a metal patch. We then apply Bondo over the patch and this will keep the rust away for many years. Similarly, we will fill all the chips and smooth them out before refinishing. With fiberglass tubs, we will apply a new fiberglass bottom which will reinforce the whole tub and cover the crack and any existing leaks. We will remove all the ugly black caulking and replace it. There is no need to replace your whole Bathtub because of these problems. 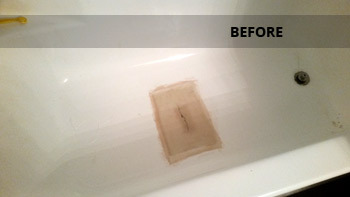 After these Bathtub Repairs are made, we will refinish the Tub to a like new condition. It will have a glossy finish in any color that you want. After we are finished with that it will look like you replaced it with a brand new Bathtub! 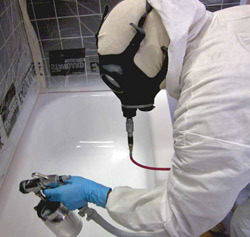 Our system of making Tub Repairs can save you a lot of time and money. Call us for a Free Estimate. We can make Repairs on any fixtures in your Bathroom or Shower areas.